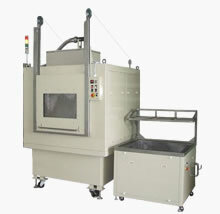 Machinery / Jet Spray washing - Sumiden International Trading (Thailand) Co.,Ltd. 1. Suitable for washing Plastic boxes and large part. 2. Main washing adopts jet spray washing which is equipped with rotational pipes with nozzeles which splash hot water (60°C). 3. Detergent is selectable depend on the contamination. 4. Each machines can be sold separately andcombined as you like. 5. Low price by design and manufactured in Thailand. QuickMaintenance available. Suitable for cleaning plastic/rubber molding die andmechanical parts to remove oil and contamination. 1. 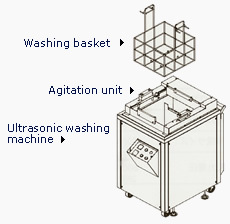 Agitation unit (option) moves the basket up and down to affect ultrasonic power thoroughly on the products. 2. 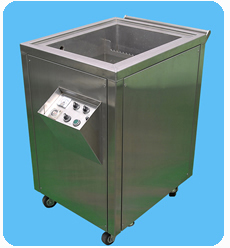 Heating unit (option) raise washing solution temperature andaccelerate degreasing efficiency. 3. Adjustable over flow screen can be set to optimum position to maximize the ultrasonic efficiency.